Detective Jay Swan is assigned to investigate the mysterious disappearance of two young farm hands on an outback cattle station. One is a local Indigenous footy hero, and the other a backpacker. Working with local cop Emma James, Jays investigation uncovers a past injustice that threatens the fabric of the whole community. 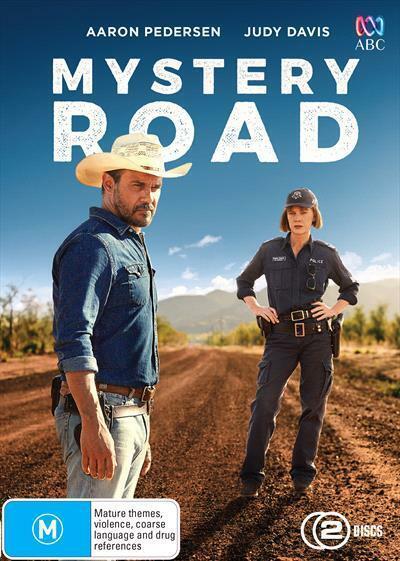 Not all movies can make the jump to television with the ease with which Mystery Road does. When I first saw the 2013 Ivan Sen movie I found myself thinking that it was a perfect tale of culture, conflict and intrigue, an Australian western. Goldstone, the 2016 sequel carried on the storytelling arc of a man caught between two worlds whilst belonging to neither. Director Rachel Perkins (Radiance, One Night The Moon, Bran Nue Day) takes the reins with this series, which sees Jay Swan (Aaron Pedersen), assigned this time to investigate the disappearance of two farm hands. Deborah Mailman stars as Kerry Thompson, whose son, a local football star, is one of the missing. Her family has already suffered great damage from a previous crime involving her brother (the brilliant Wayne Blair). Joining Pedersen and Mailman in a leading role is Judy Davis as local cop Emma James. Also starring are Ernie Dingo, Madeleine Madden, Tasia Zalar, and the criminally under-utilised Tasma Walton, whose performances all add great punch to a wonderful storyline. Perkins and Sen are two of the most prominent Indigenous directors working today, and it’s exciting to see how Perkins translates Sen’s film to the small screen. In the original iteration of Mystery Road, Sen employed a wide cinematic style that lent itself well to the big sky beauty of the Australian outback. While in Perkins’ series, she finds the intimacy of the Kimberleys in all their harsh glory, and focuses in on relationships, conflict and family. Silence can be deafening and the landscape talks as loud as anyone. Aaron Pedersen may have a lot on his plate acting-wise, but let’s not wait too long for Jay Swan to return. Lou Fulco works as a bookseller at Readings Hawthorn.